We have a full month celebrating American Symbols and Presidents. There’s going to be a whole lot of social studies-based learning going on! One of the aspects of the 1st grade social studies standards covering patriotism is that students recognize, identify and explain the significance of American symbols. I love how much the kids get into this! We research and read about these symbols and keep an anchor chart about them up in the room. We also write about the symbols in our American Symbols mini-book. This little book tucks perfectly into Abe’s hat! At the end of the unit, kiddos display their concept mastery by creating their own posters. They will illustrate and label a few American symbols while detailing a few of their most prominent facts. While we discuss the symbolism of the American flag, we also talk about the pledge. The kiddos gain content knowledge by matching the phrases they recite daily to actual written words. Discussing the job of the president, the amazing rooms that can be found in the white house, and things our previous presidents and their families have done is definitely engaging. Our writing lessons – regardless of topic – always start with an organized plan. 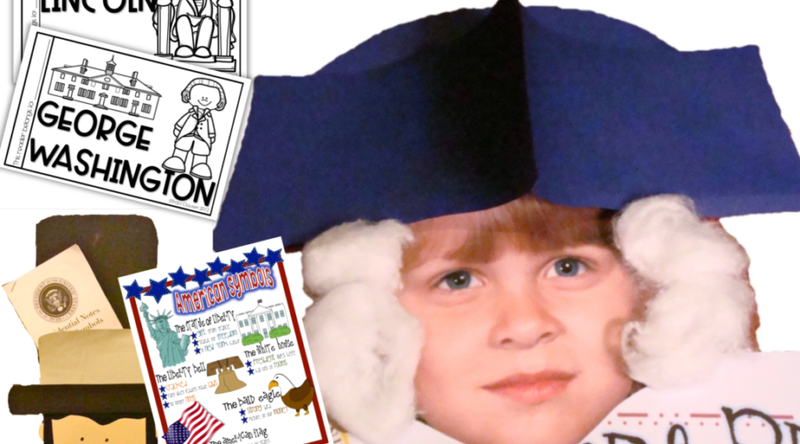 The Patriotism and President’s Day resource includes a very detailed lesson that assists in guiding students through a simple expository writing plan. I LOVE reading the ideas the kids come up with for their “If I Were President . . .” writing. The differentiated plans make it so easy for the kiddos to organize their ideas regardless of the ability of my class each year. I take a close-up picture of each kiddo and print it out at about 5×7 size. I don’t worry about the background behind them because I cut it out completely before making this craft. Ensuring something light, nearly white, is in the background saves on ink though! Placing those cotton ball sideburns and navy 3-pointed hat on their little heads just makes their day and a fabulous finishing touch to their final draft stationery. This little photo is my daughter’s long ago first grade picture. I honestly cannot believe how fast time flies! I have a couple of favorite books I love during read-aloud time with the kiddos about Abraham Lincoln and George Washington. Here are some affiliate links to my favorites on Amazon. We discuss the facts we know about these favorite presidents and complete interactive readers about them as well. The readers are quick and easy to assemble – copy 2-sided, cut and staple. Each has a word bank of key words and serve as great decodables too. As I’ve mentioned before, I organize my year in science and social studies themes and keep my room immersed in that theme for a month. Abe and George look adorable on the walls and these headers are the perfect icing on the cake. The vocabulary words in this unit are a perfect addition to my focus wall and serve their purpose in our lessons and as a constant visual and written content enforcer. I love that this resource is so complete and covers all aspects of this social studies standard while being totally engaging for my kiddos. You can grab President’s Day and Patriotism in my store.